The red carpet was laid out like at a movie premier. Families and friends lined the entrance to Browning High School. Girls were adorned in dresses of all color and size. Their dates, clad in tuxedos, walked by on their way to the big dance. It’s prom night. 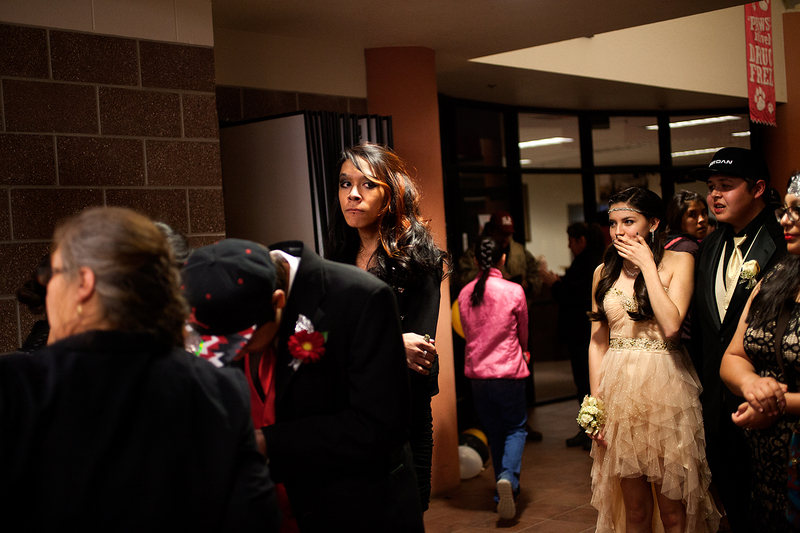 For Dale Spotted Eagle, a freshman, the night was just not about prom. It was much bigger than that. It was an opportunity. Dale saw this as a chance to wear something she wanted. You see, she doesn’t like tuxedos. Dale settled on a black, one shoulder dress, with silver sequins that formed a cuff around the wrist. 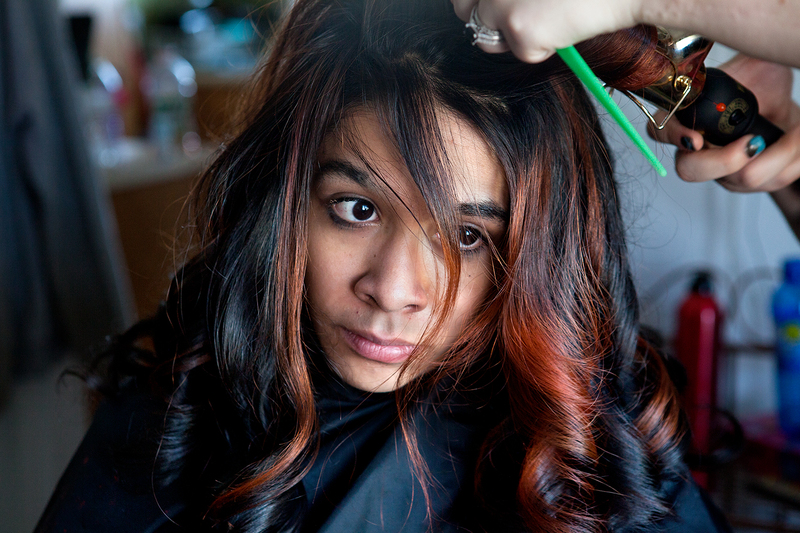 On prom night, Dale showed her family and, in some ways the entire town of Browning, just how much confidence she has as a transgender teen. The lesbian, gay, bisexual, transgender sexual minority communities have historic ties to many tribes. Throughout recent history, the acceptance and rediscovering of two-spirit people and societies has become more relevant but there remains a serious lack of resources for the LGBT community on the reservation. David Herrera, co-chair of the Montana Two Spirit Society, said the term two-spirit is used as an umbrella term to describe these individuals, regardless of their tribal affiliation. Every tribe has their own language for the concept. He said lesbian, gay, bisexual and transgender are western terms, whereas two-spirits has a more cultural connotation to it. He said that it is important to educate both Native and non-Native people on this aspect of culture that was seemingly wiped out. It had taken her a while to actually decide to go. “I waited for the longest time,” Dale said about making her decision on whether or not to attend. But she settled on going after remembering how much fun her older brother had at proms when he was younger. After deciding that it would be too expensive to buy a dress from a store, Dale and her mother went online and found several dresses she liked. Dale makes her way down the red carpet that Browning High School rolls out annually for the prom. The prom is a lavish event for locals on the Blackfeet Indian Reservation. Valets take students’ cars as they pull up to the glamorously lit entrance. Dale’s mother, Lydia Spotted Eagle, was glad Dale decided to go. It wasn’t until recently that Dale decided she’d like to use female pronouns, something that has been a transition for the whole family. Dale said she doesn’t mind when her family or closest friends have the occasional slip up. Lydia said she is working on it. 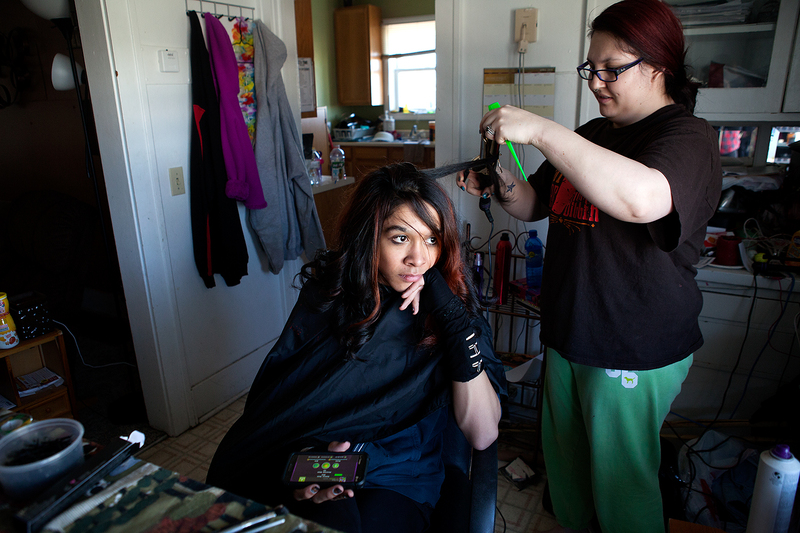 Dale Spotted Eagle, a freshman in high school, gets her nails done by her sister Molly before attending prom at Browning High School on the Blackfeet Indian Reservation. Dale identifies as transgender and recently made the decision to refer to herself with female pronouns. For Dale and other members of the LGBT community in Browning, support outside family and close friends is hard to come by. With next to nothing available in terms of resources or things to do, many yearn to leave the reservation. Dale wants to go to New York someday and start a band. But it wasn’t long before Dale realized she was unique. Her long black hair, partially dyed red, stretches to the middle of her back. She keeps her hair pulled back in a ponytail, leaving enough to cover a portion of her face, hiding her big, dark brown eyes and doing a disservice to eyelashes that would make a supermodel jealous. Admittedly, Dale says her most masculine feature is her voice, though she doesn’t expect it to stay that way for long. Lydia said she noticed a change in Dale about three years ago. Dale, who was in the sixth grade, refused to wear any of the boys clothes Lydia bought. It got to the point where she told Dale to point out what she wanted and Lydia would buy it. She remembers shopping for school clothes before the start of the eighth grade school year at a Rue21 store when Dale brought her an outfit that she wanted. She bought the outfit and told her if it was something she wanted to do, then they’d continue to do it. At that point, Dale had not shared her thoughts on being transgender with her family. It wasn’t until the middle of her eighth grade year that she laid it all out on the table. But before that moment, Dale researched the term “transgender” to try and find out what it meant to identify as such. Lydia saw that her child was struggling with her identity and she made it clear to Dale where she stood on the matter. “I told him right there, I said ‘Dale, if that’s who you are, then it’s ok,” Lydia said. But that’s not what Dale was worried about. She figured it would be easier coming out to her mom, who works as a therapist at Browning Middle School. The hard part, she feared, was telling her father, Russell. Now, nearly done with her freshman year, Dale is much more confident and comfortable with who she is. She says she’s not bullied as much as she was in middle school, when kids would sling slurs. Many of the kids who gave her a hard time have matured and those that haven’t, she’s learned to ignore. DAKOTA RUNNING CRANE wants to travel to Paris. Running Crane, a 21-year-old gay Blackfeet man, is a kind-hearted soul who skips the handshake and goes straight for the hug. He likes to sketch fashion designs and hopes to one day attend the Art Institute of Seattle for fashion design. Yet, for now, he stays home and helps take care of his two younger siblings as well as numerous nieces and nephews. On a typical Sunday morning, Dakota Running Crane cooks brunch for his extended family at his mother’s house. Dakota describes the Blackfeet Indian reservation as an incredibly challenging place to be out. “I’m like the unofficial housewife,” Running Crane said with a chuckle. Running Crane said it took a while to admit that he was gay. After he graduated high school, he saw in others an unhappy path that he might have soon shared. Even though he thought he had everyone fooled, he said he was surprised to hear that there had been rampant rumors that he was gay in high school. He had a good group of friends that came to his defense. He described it as a survival technique and, with the exception of a few bullies, he got along with everyone pretty well. “Since I wasn’t out of the closet, I wasn’t picked on as much because I kind of hid it,” Running Crane said. Looking back, Running Crane kicks himself for the unnecessary emotional turmoil he created by staying in the closet. Especially now when people say they knew all along and just wanted him to be happy. Raised in a strong Catholic family, he often heard the stigma that gay people go to hell. That weighed heavily on his mind. Some family members, who Running Crane say were raised on the Bible, showed animosity towards gays. While he is still influenced by and respects the Catholic Church, he has distanced himself from the faith. 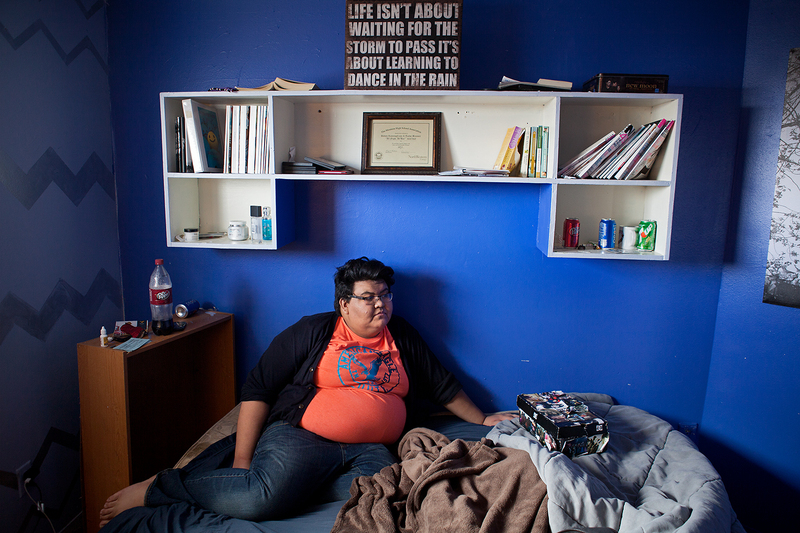 Dakota Running Crane, 21, came out to his family and friends shortly after graduating high school. They were unsurprised, he said, and most of them were fully supportive. Dakota is looking for work and hoping to save enough money to move to Seattle to attend fashion school. He watched coming out stories on YouTube and drew inspiration from LGBT celebrity advocates like Anne Hathaway. As he became more comfortable, it was easier for him to accept himself. Still, it was a process, and one he continues to go through. Dakota cut back on drinking when he realized it fueled his anxiety and depression. Running Crane said a lot of people stay in the closet due to fear and admits that he was also scared to come out. But his mother’s response after he did allowed him to shake that fear. 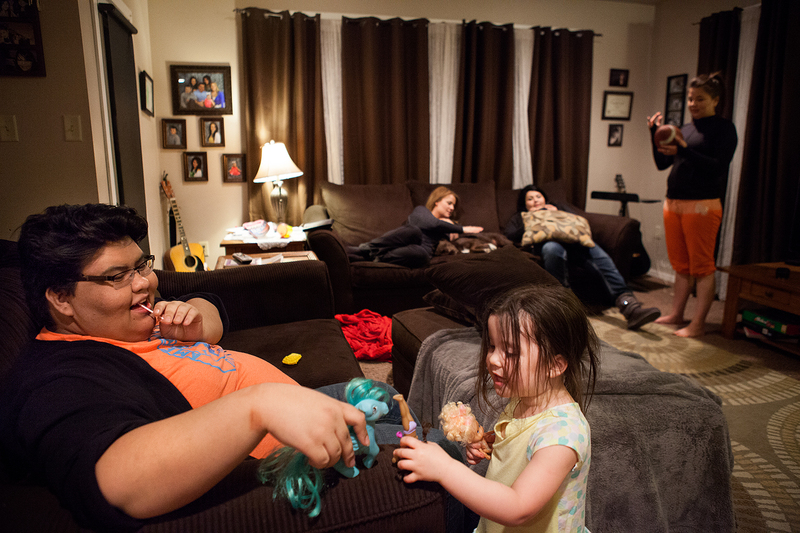 ANNA BULLSHOE, 53, has lived on the Blackfeet reservation for the majority of her life. For the last 23 years, she has been with her partner, Anne Pollock. Together, they are “the Anns,” and have seen the changes on the reservation in regards to public attitude toward the LGBTQ community. Cultural loss is something not only the Blackfeet are struggling with, but tribes across the country as well. For those who identify as LGBT, living traditionally can be difficult as they sometimes question their roles within ceremonies. In the wake of this, the concept or term two-spirits has seen a resurgence among Native Americans. Historically, two-spirit people didn’t identify as a man or woman, but were seen as having traits, either physical or spiritual, of both genders. “What it means to me is I’m different but I’m also awesome,” Running Crane said with a laugh. 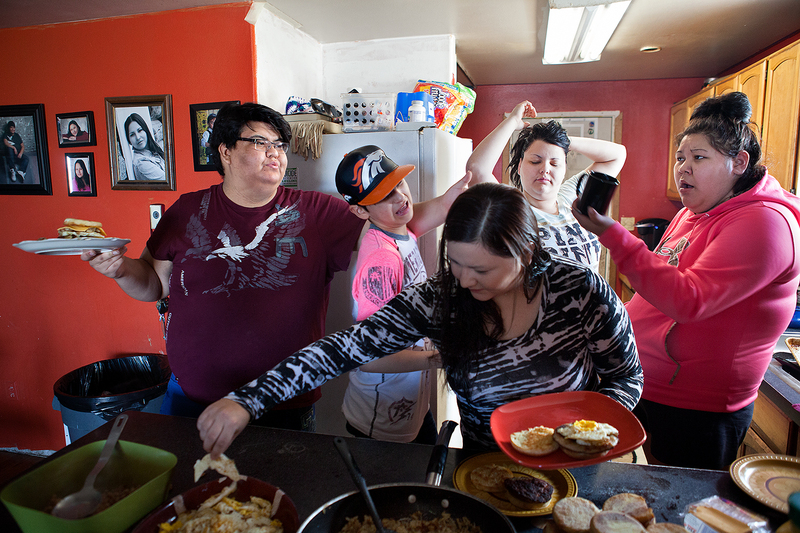 “I just kind of take it as: I am two-spirit. I totally embody male and female traits. I cook, clean, I do hammering sometimes. But I don’t even know what a wrench is. Last summer, he attended a two-spirit conference at the Blacktail Ranch between Helena and Great Falls. It was unlike any event he had ever been a part of before. Running Crane befriended a transgender woman named Spirit Wild Cat and said he learned a lot from her. Running Crane smiles when talking about the time he spent there. He met a lot of successful people from the LGBT community. It inspired him to one day be in the same position they are. While they are at different points in their lives, both Dakota and Dale aspire for similar things. They both realize that the prospects of life in Browning are bleak, but it is apparent how important their respective roots are to them. “Any chance to get out of Browning is best,” Running Crane said. Yet, he is quick to call Browning home, both culturally and physically, admitting that he would miss the mountains most. LYDIA TRIES to keep Dale at home. For her, it is about keeping her children safe. As far as support for this minority within a minority, there is next to nothing available. Dale, along with her friend Chazz, attempted to start a group at the high school called the Gay-Straight Alliance at the beginning of the year. But the group stopped meeting after a month or two due to infighting among some members. It’s up in the air as to whether or not it will return. And then there is the prospect of dating. Not only is the pool of suitors small due to the lack in size of the LGBT community, but also to the fact that many people in Browning seem to be related one way or another. “I care deeply about it because I do want to find a partner to share my life with,” Running Crane said. Although, Running Crane said he doesn’t really look for a partner in Browning. Dale will stay in Browning until graduation in 2018. She’s more blunt about the idea of returning to Browning once she’s left. Dale, who turned 15 on April 20th, received a present she has been wanting for some time. At some point, early in the summer, Dale will begin hormone replacement therapy to fully transition into a female body. She is also in the process of picking out a new name. She first settled on Niccole, but has since changed to Ashlyn as she looks for a name she likes and is comfortable with. Hormone replacement therapy wasn’t something Lydia considered right away. She thought that Dale should wait until she was a little bit older. Dale said she showed her mom videos of other people’s transitions and told her it wasn’t just a phase, but that it was something she really wanted to go through with. After doing some research, Lydia found a Planned Parenthood in Great Falls that would help get the process started for Dale. As for Dale’s take on that moment? Native News Project 2015 | The University of Montana | School of Journalism.